The Barney Carriage House is considered to be an oasis in the midst of a restless city. Set in Forest Park in Springfield, Massachusetts, the Barney Carriage House is an elegant Victorian estate that is surrounded by gorgeous, well-kept grounds. The venue has a special ambiance, a lovely natural setting, and a staff that guests will rave about. Wedding ceremonies may take place on the landscaped terrace, under the gazebo, in the Victorian Pecousic Villa Banquet Room, or in a luxury tent provided by the venue. The house is exceptional, but the real treat for couples and guests at this location is the grounds. This image focuses on the beauty of the natural setting the venue provides and creates a picture that is a work of art. Upon looking at the photo, the eye is immediately draw to the figures of the couple who stand between the towering forms of the trees. 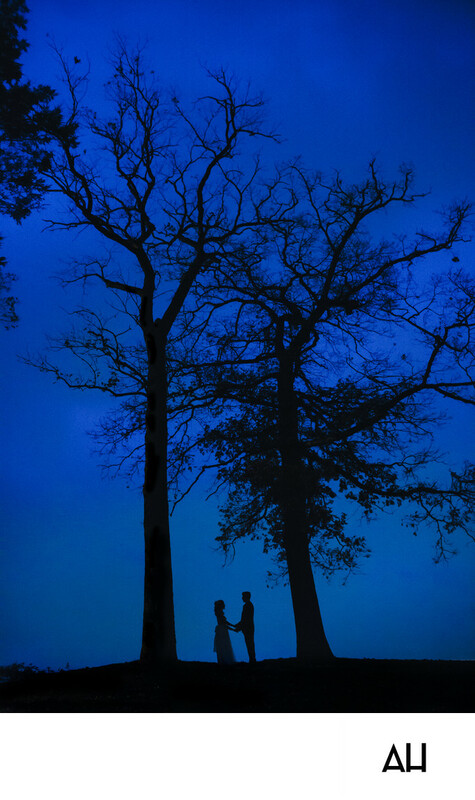 The dark silhouettes of the bride and groom stand out boldly against the royal blue of the evening sky. The image is timeless and looks as though it could be a still from a Disney film, such as Sleeping Beauty or Cinderella. The bride and groom are like a princess and her prince, meeting on a hill and taking one another’s hands. Even without seeing the faces of the couple, it is clear that they are deeply in love with one another. There is a sense of calm about the two figures and one can’t help but think that they are smiling into each other’s eyes as they hold hands on that distant hill.